I featured Aab in a post here back in April. Right now they are having an end-of-line sale to make way for a new and improved range which will be arriving within the next two weeks. You can get 50% off all their products, and they even have maternity abayas from just £14.99 for you blooming Muslimahs! I was the 'blooming' muslimah who requested some stylish pieces from you. I gave birth to a beautiful baby boy 10 weeks ago =). Now I am back to my pre-pregnancy size, and regularly check out your blog for new ideas. Sure you can add me, if you know who I am! 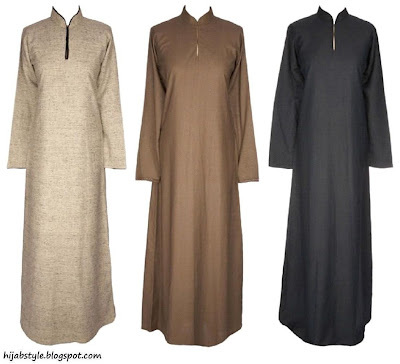 Hi, Since I'm a western christian I wouldn't feel comfortable wearing these as daily wear because they are associated with Islam, but, oh, I wish I could!They are undeniably beautiful and gracious, and I would consider wearing an abaya as a hostess dress or lounge dress. It's the same basic idea of an abaya, except it's by Jean Paul Gaultier!